Snorkeling Hideaways Beach can be very enjoyable. This beach is in Princeville. The access to it is near the entrance to the St. Regis Princeville Resort. It is a beautiful little secluded beach with gorgeous turquoise waters and interesting reef visible while you scramble down the hillside to it. Hideaways is also known as Pali Ke Kua. 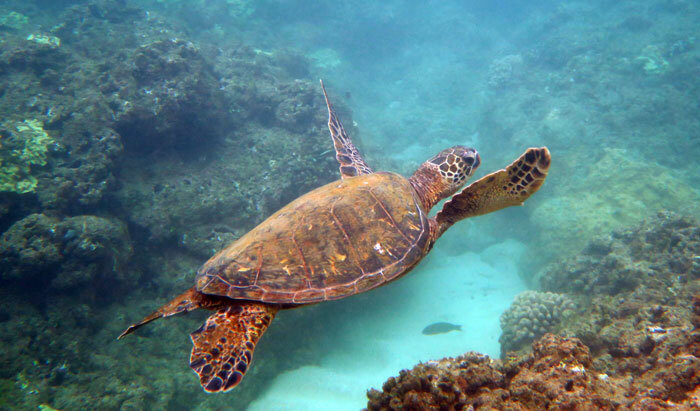 When the ocean is calm, in the summer months, snorkeling Hideaways is great. At other times it is a surfing beach, so don’t snorkel when there are big waves. This beach is difficult to access for 2 reasons. First, the parking is very limited. 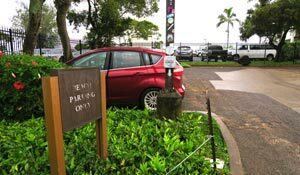 A small public parking lot, for 9 or 10 cars, is provided for access to both this beach and Pu’u Poa Beach, meaning if you are not staying within walking distance to the trailhead, you must arrive by 8 a.m. to get a spot. 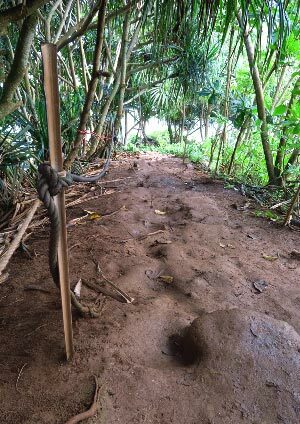 The other reason is the trail itself is very challenging, if not treacherous to “walk” down. You access Hideaways on the trail just east of the parking lot. 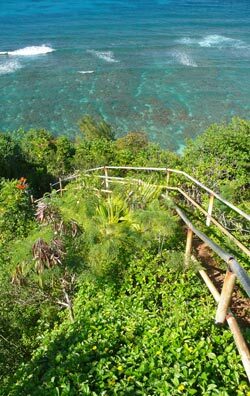 After a short section of flat trail, you will find a very steep set of stairs followed by what only can be described as a treacherously steep trail. If you miss a step you are going straight down the hillside. The trail has gotten even more dangerous over recent years. There is a rusty handrail at the top and what used to be a handrail on the lower part of the trail that has now degraded into sharp bits of metal with some ropes, wires and garden hoses tied between them. These spiky leftover handrail poles are dangerous, particularly if you happen to fall on one. Have no doubt, this is a trail only for physically capable people. And when it has been raining, which is a lot of the time here, the dirt trail becomes extremely slippery mud. That said, if you have the nerve and physical endurance to get down the hill, then it is worth it. You can enter the water for snorkeling Hideaways Beach in bare feet, but be aware of the reef spurs that come close to the beach when you are entering both for your feet and so you don’t damage any coral that might be there. 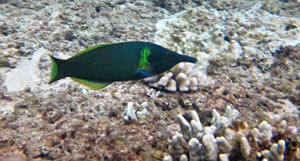 It is quite easy though to find a channel to walk into and put on your fins. The beach here can be quite steep, so watch for large drop-offs in the sand on entry and exit. As you will see through your polarized sunglasses on the way down the hill, there is a lot of spur and groove reef here that runs perpendicular to the beach. It comes very close to the shoreline making the access once you reach the beach easy. You can snorkel in and out of the grooves in front of the beach. Sometimes you can find an area to swim over the reef farther out to get to the next groove over. 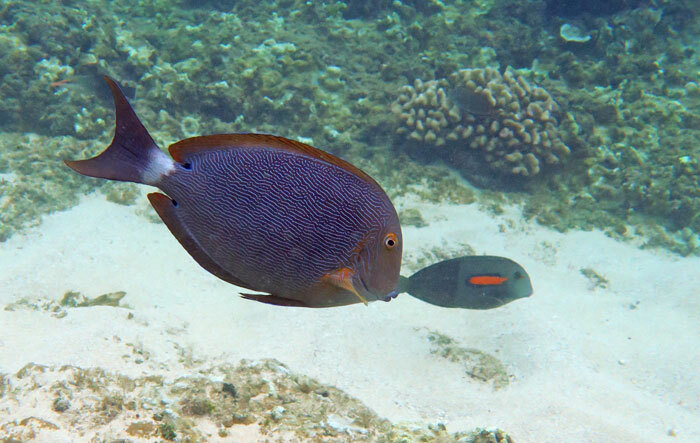 The water depths are fairly shallow on the reef in front of the beach, no more than 10 feet. You can swim straight out until you get close to where the waves are breaking, and you will still be in shallow reef. There is no real reason to swim a long ways out though. The best stuff is close to shore. 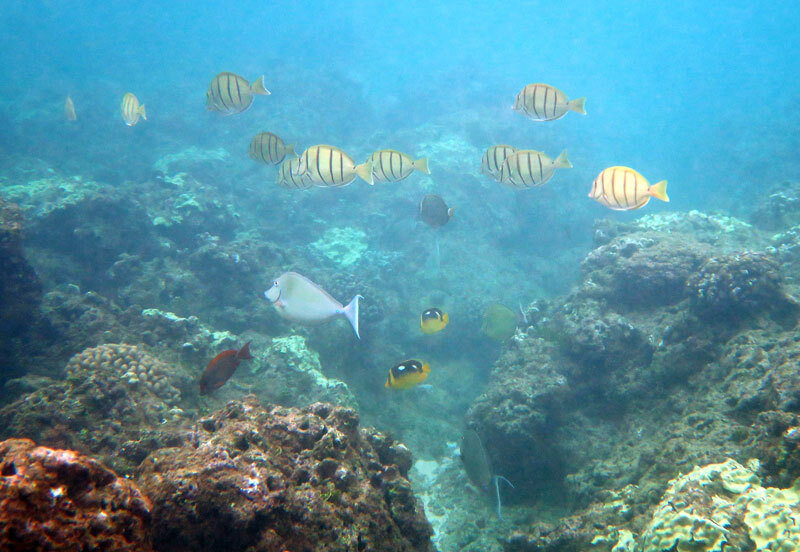 There is very little live coral, but there are tons of fish, and the channels provide interesting topography to explore. The water visibility snorkeling Hideaways Beach can be very good during calm summer days. But it can get pretty poor other times. Toward the right side of the beach there is a rocky point and the water is deeper in front of it, 15 feet or so. 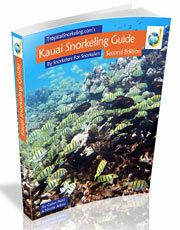 It is also spur and groove reef here to explore, just deeper. And if the waves are up this area can have current and very poor visibility. You will notice that there is another beach farther to the right, but the snorkeling in front of it is not nearly as interesting as snorkeling Hideaways Beach and there aren’t as many fish. 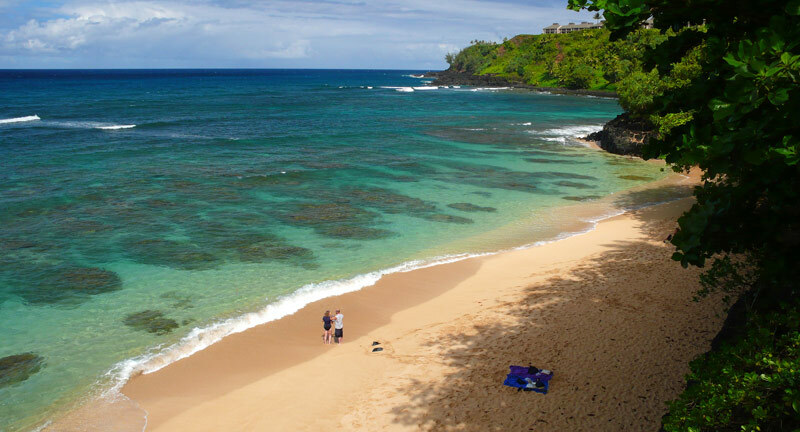 Hideaways Beach is in Princeville. Princeville is on the north shore of the island off of Hwy 56 (Kuhio Hwy). 1. From Hwy 56 turn north on Ka Haku Road, and follow it to the end, which is the St. Regis Resort entrance. 2. Park in the designated public beach access parking area on the right side just before the gate house. 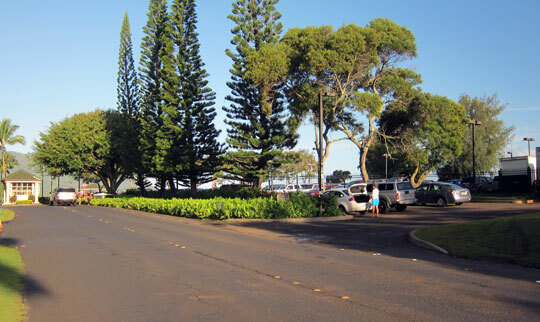 The dirt path is just before the parking lot on the right, next to the Pu’u Poa condo’s tennis courts. None, but some of the beach is shaded by trees on the shoreline. 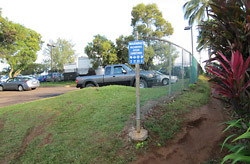 There is a public restroom in the Princeville shopping center back out on the main highway.